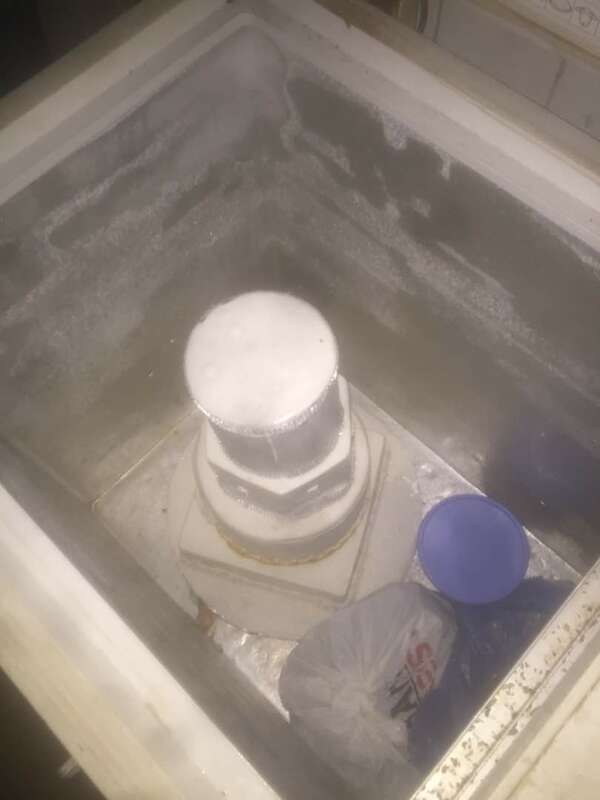 The birthday cake sits in the cooling freezer, white and large and almost royal. 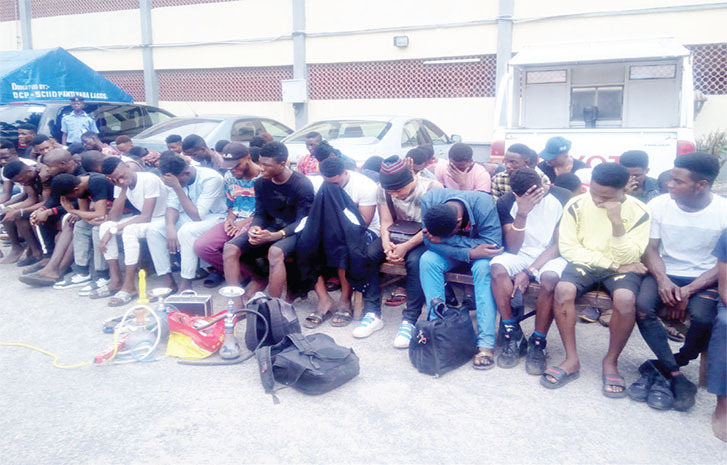 It now a week since 57 gay suspects were rounded up at Kelly Ann Hotel, Egbeda, the cake is still yet to be sliced or tampered with. Evidence preserved. It belongs to Prince and James (surnames withheld), the friends co-celebrating their birthdays at the hotel in which they had lodged in. 23 and 25 now, their respective ages. I take in details of the hotel premises as the hotel staff puts the cake back in. The swimming pool is close to where we are, but it’s drained of water. The car of the driver who conveyed the party drinks and food to the venue is in the compound. 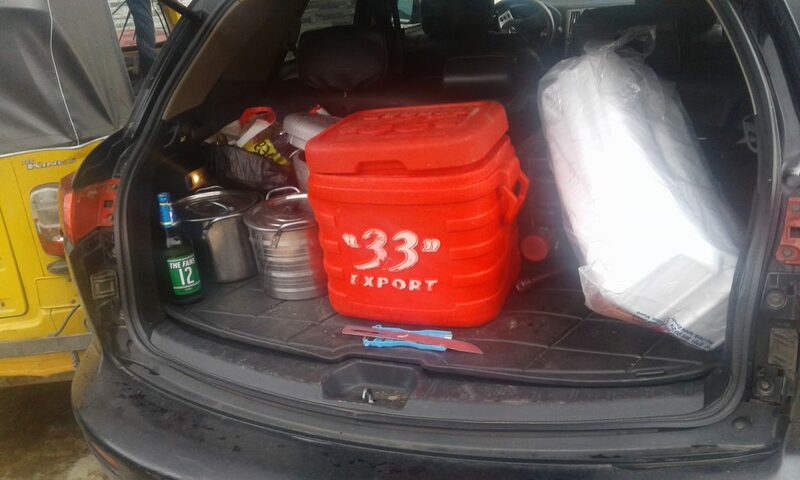 The boot is flung open, showing stainless steel serving pots, coolers, a beer bottle, and disposable food packs. The driver, too, is among the 57 gay suspects arrested by the police. I walk into the hall, my hands numb from the morning cold. “The crime scene,” a man says to me, standing by a door towards the end of that hall that I didn’t realise was there. I don’t know who he is, and I can’t tell if I’m supposed to find it funny. Though the hall is large and empty, save for stacks of white chairs pushed towards the corners, I feel the claustrophobia closing in as I relive an experience that’s not mine. The crushing mass of bodies, the stampede and the trampling, the capable ones scaling over the hotel’s sharply barbed fence to evade the police and leaving with bodily injuries as souvenirs. I move out of the hall quickly. “So you are the one that dragged Segalink,” the manager of the hotel finds me outside after I introduce myself. We have a small, awkward laugh about this, more surreal for me because I didn’t expect him to mention my piece on the famous anti-SARS campaigner. And “drag” is so millennial, and it feels right on point coming from this youngish manager. He tells me that the police invaded the hotel around 2 a.m. that morning, forcing everyone in the hall to kneel down. He was inside and had to rush out when he heard the noise. Working on a “reliable tip” the police received via text message that the birthday party was a gay ‘initiation’ (a term that neither the press who questioned the 57 suspects or the police officers who arrested them are yet to define), the manager informed them that it was nothing of such. “There were girls there and there were guys there,” he recalls, and I notice for the first time that his eyes are somewhat milky, more cloudy in the right than the left. A health condition maybe, but I didn’t press questions. After the rounding up, the police separated the party attendees that were women from the men, temporarily held them until the women were suddenly instructed to go home. “They said they were looking for hoodlums, cultists and contraband,” the manager adds, and I suddenly realise how the police were desperate to pin something “illegal” on the unwarranted arrests, before going for unfounded homosexuality which usually works, in collusion with the anti-gay law. There are people idling about in the premises and “Make dem burn all the gay” is the last thing I hear as I leave the hotel, the air shrouded in gloom. I’m in the company of Yomi Aka, a lawyer from The Initiative for Equal Rights (TIERs), the organization that is handling the legal proceedings around the arrest. We are followed by a small crew. We are on our way to the Chief Magistrate Court, Yaba, and my mind goes back to the cake, which the police has failed to account for in their accusations and the public that damned these men conveniently dismissed in their judgement. The question remains unanswered; who brings a lavish birthday cake to a forced or voluntary initiation? The court is presiding over the case, and the families of the suspects are everywhere, agitated. In the hallway, I luckily meet Prince, open to talk. He tells me that he was in the hotel room with a couple of girls doing their make-up and getting ready for the party when he heard the commotion downstairs. Fearing for their lives, he locked the door until the manager came up to inform them that the coast was clear. The suspects are on administrative bail now. Or at least they have been offered the option of administrative bail. A Permanent Voters Card, a recent house rent receipt, a recent PHCN bill, three years tax clearance (a ridiculous requirement considering the vast majority of Lagosians work itinerant jobs and pay tax indirectly through universal taxation methods like VAT), letter of appointment of employment, three sureties per person who have landed property in Lagos – requirements to be eligible to pay a 200,000 Naira bail. These requirements are at best classist and targeted to punish the poor for a system that denies them basic amenities and functioning infrastructure and only bows to the rich or socially connected. Contrary to Segalink’s tweet dated August 29, 2018 where he states that all the accused men have been ‘granted’ bail and implies that the arrested men are free and returned to their families pending a proper investigation, 80% of the accused men are still in custody with their families unable to either meet the bail requirements or raise the financial surety. “The Nigerian system is too bad,” Mr. Peter laments, a father of one of the suspects who says his son is neither of the things the police are accusing him of. His right arm is cocooned in a plaster cast. His son, 20, was preparing to write an entrance examination for a university on September 6, but will very likely miss it. I sympathise with him, feeling a spectrum of emotions from sadness to anger. The 57 suspects are still in Ikoyi person, no evidence for the allegation of homosexuality, 57 innocent citizens bearing the brunt of a law that cruelly seeks to deny LGBTQ Nigerians their humanity and a legal system that favours the rich and socially connected. As I leave the court with a heavy heart, I think about a lot of things, the most terrifying being the reality we must endure that the Nigerian police can arrest anyone without evidence and frame them for homosexuality again, relying on our collective bigotry to aid them in the obstruction of justice.